NOSE: Hopariffic. I was expecting a big hop aroma, but this blew me away. Overwhelming notes of grapefruit and pine leave your eyes watering and your mouth salivating. I tried to sniff the malt backbone, but the hops just overpowered everything. The Prof claimed that it smelled like sticking your head in a Ziploc bag of fresh Cascade hops. I personally try not to put plastic bags over my head, so I’ll take the Prof’s word for it. TASTE: “Only” 76 IBUs, but it makes the 112 IBU Founder’s Devil Dancer taste like a Brown Ale. Goes to show that IBUs only tell part of the story. This is a mouth-imploding, eye-watering, bitter-as-hell hop-bomb. Considering it’s just a “standard” IPA and not a Double, that’s pretty damn impressive. One of the hoppiest brews I’ve ever had. Big citrus flavors up front, a sweet, pale malt backbone in the middle, and a hugely bitter, drying finish. Very nice. MOUTHFEEL: Medium-bodied with great carbonation. A supremely drying beer on the palate. DRINKABILITY: Far too bitter to session with, but still a highly drinkable beer. Actually, you might as well just drink it all night, because you won’t be tasting anything else afterward. 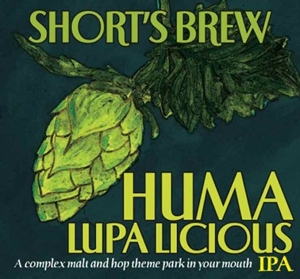 Posted in Tasting Notes.Tagged Ann Arbor, Ashley's, Huma Lupa Licious, IPA, Shorts. Wow, I’ve never heard about these guys and they’re right in my northern Michigan summer stomping grounds. Thanks for posting this one, sounds awesome and I will be checking Short’s out.